With our top-selling Winter Warmth blend since 1999, this candle is always the perfect host: Its warmth and sweetness spreads good cheer throughout any room. Reminiscent of an old-fashioned Christmas, with orange and spice and everything nice. 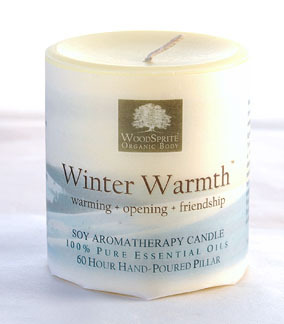 Pure Essential Oils of Organic Sweet Orange, Ginger, Clove Bud, Ylang Ylang & Cassia. 100% Plant-Fiber, Unbleached Wick. 60+Hour Burn.